In Maine, where the seasons are so sharply defined, each month has its own special characteristic, and for July it is fecundity. I was reminded of this yesterday when the dog and I took a walk to the Narrows Pond. Around my head buzzed tiny flies. Larger but still small insects dotted the water. Up and down they went, in some kind of dizzying dance, and occasionally a fish rippled the surface. 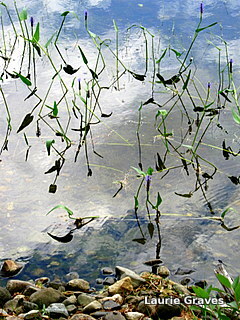 Dragon flies darted in unison over the Narrows, over the purple flowers of a water plant whose name I don’t know. All around me is life, life, life, with the insects, plants, and creatures taking full advantage of this warm time. Flowers are in bloom, along the roads and in gardens. Tiny cucumbers are ready to be harvested. Fledglings have begun leaving the nest, and in our backyard at one of the feeders, I have observed what looked like one adult woodpecker feeding another adult. I am certain this is not the case, but rather a parent still feeding “junior,” who is not quite ready for independence. Yesterday two crows hopped around the backyard, one crow feeding, the other crow following with its mouth wide open. The feeding crow did not oblige, figuring, perhaps, that it was time for this junior to strike out on its own. July. One day it is brutally hot and humid, but then a storm comes and clears the air. Sometimes, the windows stay open at night, and sometimes they must be closed. The days are still long enough so that Clif and I can easily go for a bike ride when he comes home from work. We are edging into buzzing August, one of my favorite months of the year, when the humidity leaves, and fine, dry weather settles over the state, giving tourists the illusion that they have somehow wandered into the Mediterranean. Even the light seems more golden, more luminous. We Mainers know better, but we, too, bask in the illusion, preferring not to look ahead to the long dark and cold. And in late July, with the promise of August just around the corner, the life cycle seems in full swing, filling my senses with its promise and heartbreak.